Molly Hatchet perform at the KSHE 95 Pig Roast Saturday. Photo by Keith Brake Photography. As most Saint Louisans know there are two things you can count on; KSHE 95 to bring us some great music and summertime humidity. 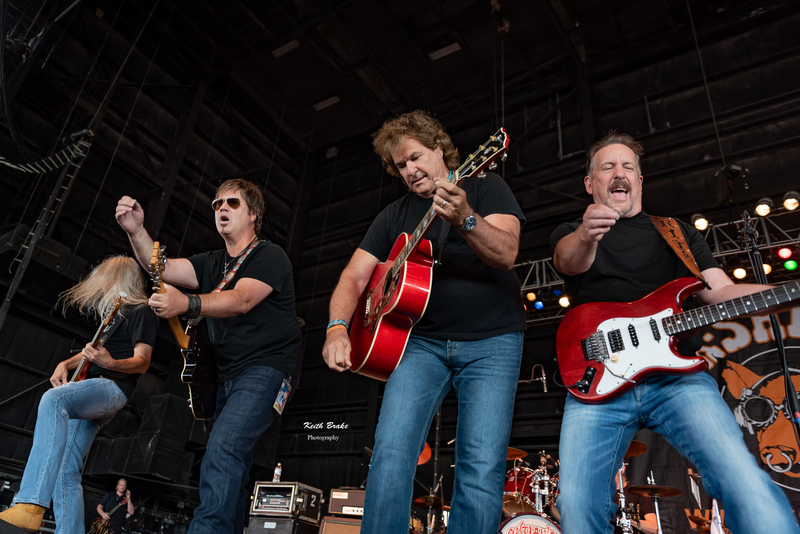 This past Saturday (6/9/2018) we had both in abundance as The Hollywood Casino Amphitheatre hosted the 2018 version of KSHE’s Pig Roast. Seven of the areas favorite bands from the 70’s played for their still passionately devout fans whom had packed the amphitheatre as soon as doors had opened. The action was spread over two stages to allow for a seamless transition between acts and once those in attendance figured out who was playing where it all shaped up quite nicely. 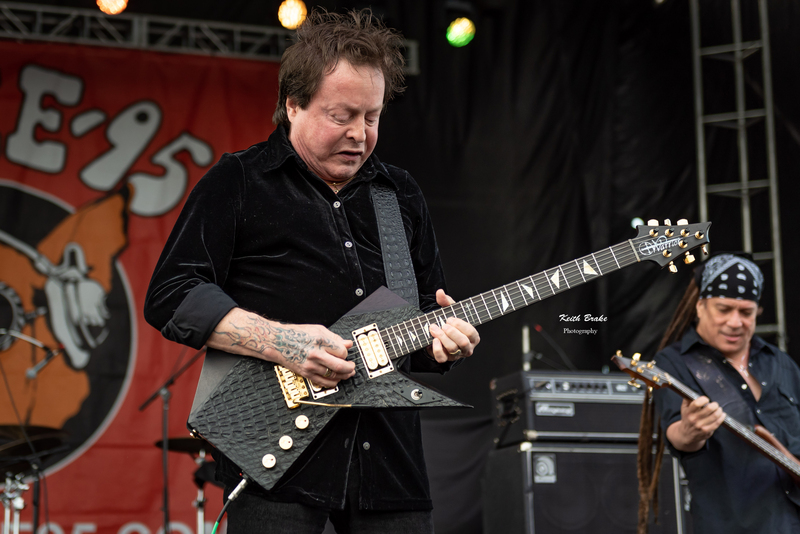 Rick Derringer performs at the KSHE 95 Pig Roast Saturday. Photo by Keith Brake Photography. Rick Derringer kicked of the day of musical nostalgia on the North stage and was met with a very nice ovation. Rick spoke of recording the song “Hang On Sloopy” at the tender age of 16, that’s right 16. Rick is still giving his fans a fine show even after all these years, it is obvious he still has passion for his craft. 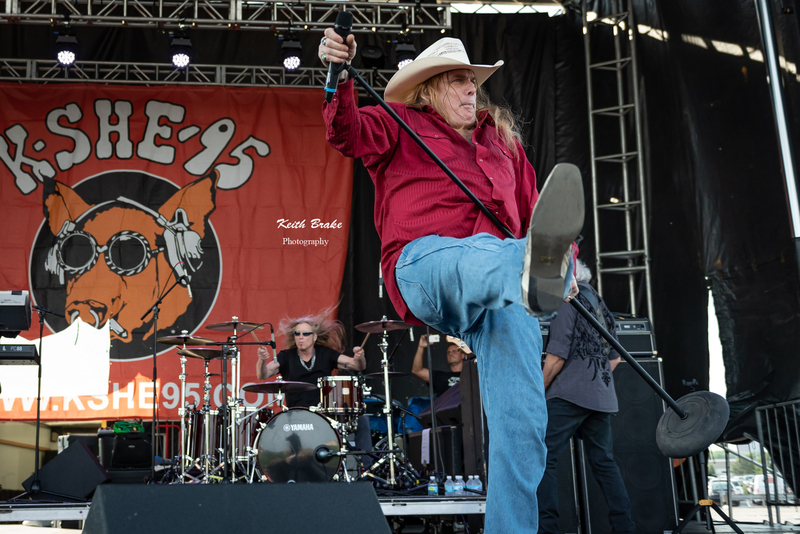 The Outlaws perform at the KSHE 95 Pig Roast Saturday. Photo by Keith Brake Photography. Starting the action on the main stage was The Outlaws. This classic southern style rock band showcases the work of three very talented guitarists. The group is tight musically as well as showing great vocal prowess. As the saying goes some things just get better with age and these boys show now signs of slowing down at all, still entertaining and sounding better than ever. All the groups that graced the stages of the amphitheatre for this party were far beyond adequate but I was certainly impressed with Molly Hatchet’s set over on the north stage. These Florida boys took the stage with reckless abandon and made all kinds of quality high octane noise. High energy and crowd interaction paired with that familiar Florida guitar rock, made this one of my favorite sets of the day. 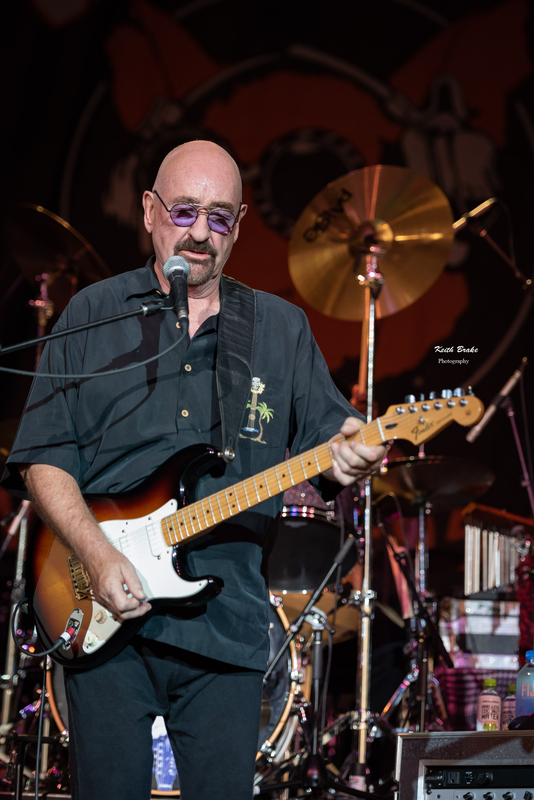 Dave Mason performs at the KSHE 95 Pig Roast Saturday. Photo by Keith Brake Photography. The last two acts of the evening were on the main stage, Dave Mason and the legendary Charlie Daniels Band. Dave Mason’s set was as good as any I have heard in a while. Everything Dave and his band tackled they played to album quality and they were the talk of many in attendance upon closing out a fantastic set. 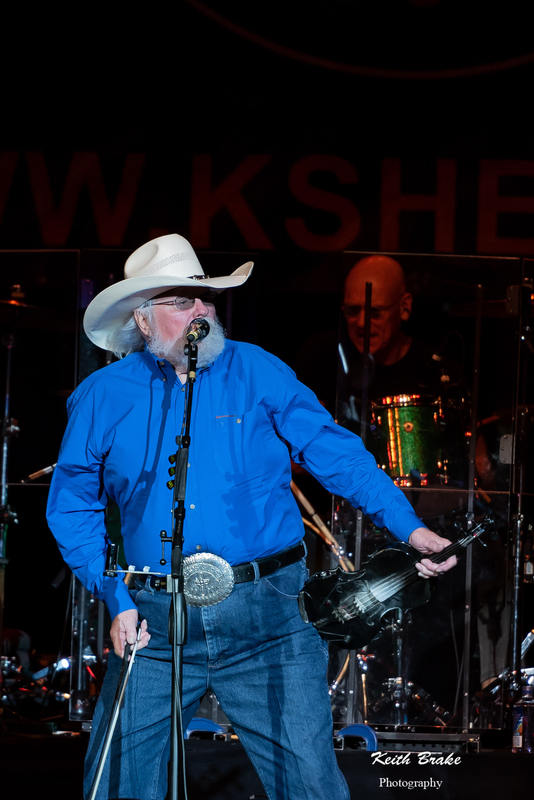 The Charlie Daniels Band perform at the KSHE 95 Pig Roast Saturday. Photo by Keith Brake Photography. The festivities closed for the day with a monster performance from an 81 year old fiddler named Mr. Charlie Daniels. Daniels and his band mates took the stage to raucous applause and got straight into their set. On this swelteringly hot and humid day Charlie and the boys played a seventeen song set that was worthy of any and all fanfare that it received. As one may expect, all the favorites were on display, all leading to “The Devil Went Down To Georgia” and yes, it was as amazing as it should have been. Charlie and the boys don’t play as much as they used to but if you ever get the chance to see them you should jump right on that. 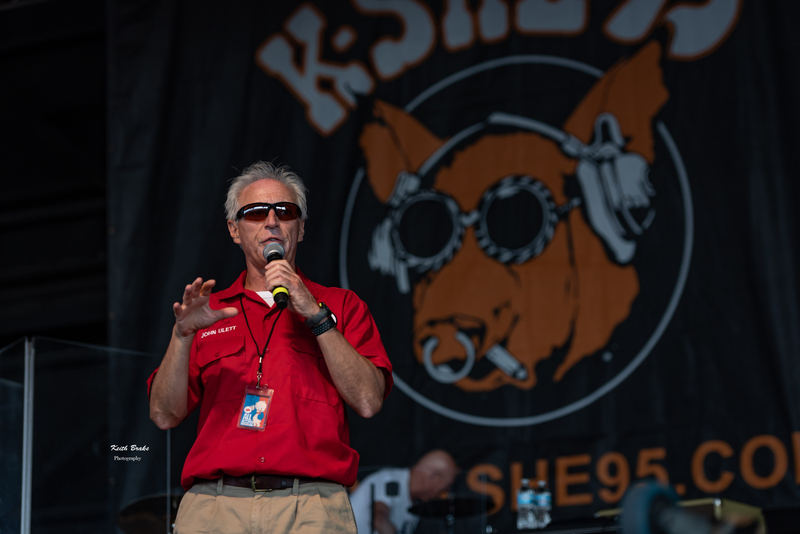 KSHE95 on air personality John Ulett at the KSHE 95 Pig Roast Saturday. Photo by Keith Brake Photography. Before I put my pen down, I have something I would like to take a moment to talk about to anyone who may have been in attendance for this show. Please know that when it comes to photographers working these events it is NEVER our intention to be in your way or ruin your evening. We all try hard not to be in your way, as you paid for your experience. While the vast majority of concertgoers in Saint Louis are very polite and respectful to not only us but the video guys and security as well, Saturday a group of fans went outside the limits of the norm. What I witnessed happen to my fellow media members was in so many ways unacceptable; being hit in the back, being pushed and being cursed as if we were animals all because we were trying to do our job. I beg of you, to those who took part, this one favor; please realize we are all part of one big family, it all ties together folks. The images, the articles, the FANS there screaming, these are ALL elements that allow Saint Louis to bring in the fabulous artists that we have become so accustomed to watching. 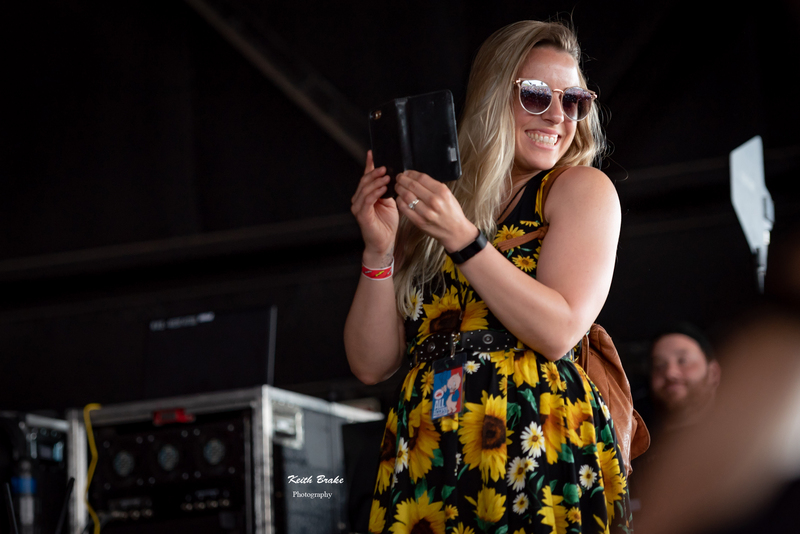 So when you see some woman or man squeezing into some tight space with professional equipment trying to get a few images, just know that like security and road crew we all are just doing our jobs, and we will be out of your way in no more than three songs. And please know that what we do helps document what you see, and shares your experience for others as well as having place to go to for helping you remember the night. So please, folks, a few moments of patience and everybody wins. To the vast majority of wonderful fans in Saint Louis – THANK YOU for your patience! KSHE95 on air personality Lern at the KSHE 95 Pig Roast Saturday. Photo by Keith Brake Photography. As always, much love everyone, Peace! POCO performs at the KSHE 95 Pig Roast Saturday. Photo by Keith Brake Photography. 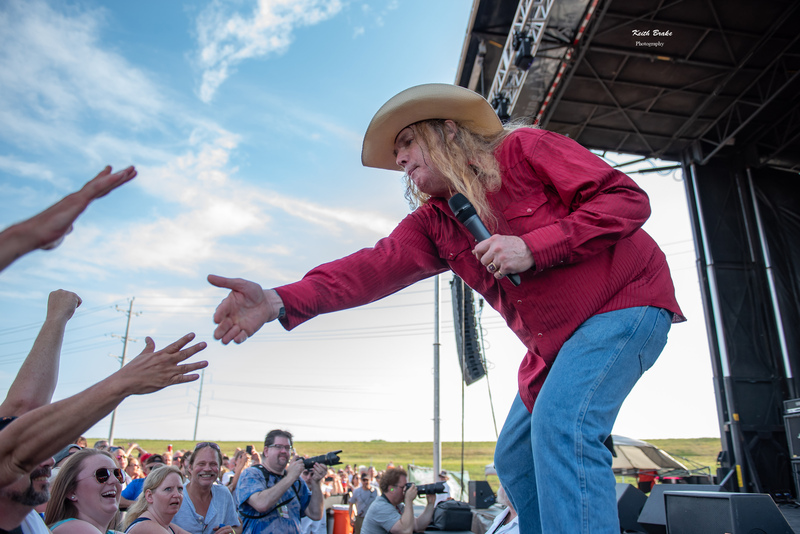 The Marshall Tucker Band perform at the KSHE 95 Pig Roast Saturday. Photo by Keith Brake Photography. Awesome show, photo and reviews! Thanks was a great,fabulous show ! The crowd was friendly,staff was,too,and vendors and security. I don’t want to forget that it rained that day,and cooled down,and there was a nice breeze,and the hill was dry. All of the bands,were excellant. God bless,Charlie Daniels. Thanks to K-SHE,for this event,and to all the photographers who captured this concert.